Light blue with the national flag in the canton and the 14-pointed star from the air force roundel in the lower fly. Sources: Pedersen 1980 [ped80], Znamierowski 1999 [zna99] and Album des Pavillons 2000 [pay00]. Square vertical tricolour of light blue-dark blue-yellow. Source: Album des Pavillons 2000 [pay00]. According to Album des Pavillons 2000 [pay00], the roundel is light blue with a 14-pointed yellow star and a dark blue border. On this image you can see the latest RMAF roundel design. It is essentially the same as the one shown above, however, the order of the two tones of blue have been reversed with the lighter blue making up the outer ring while the darker blue makes up the inner circle. 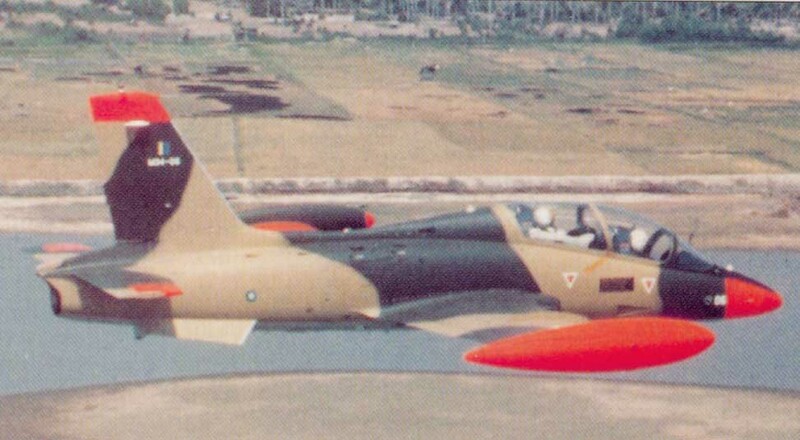 I do not know when this new design was officially adopted but it has been progressively replacing the older designs on newly repainted RMAF aircraft. According to Cochrane and Elliott 1998 [cos98], the roundel was used since 1963 (when air force was founded) until 1982 in square form. "The history of military aviation in Malaya started in 1936 when it was still under British rule. The Straits Settlements Volunteer Air Force (SSVAF) was formed by the British and equipped with Hawker Audax aircraft. In 1940 it became the Malayan Volunteer Air Force (MVAF) and operated civil aircraft, including de Havilland Tiger Moth, Leopard Moth and Rapide. Although this force escaped from the Japanese invasion of Malaya, the fall of Sumatra which followed saw it defeated by overwhelming odds. That was the end of the early air force that was nurtured by the British." The Malayan Auxiliary AF was reformed in 1950 and in 1 June 1958 the new independent Tentera Udara di Raja Persekutuan was formed (renamed Tentera Udara Diraja Malaysia in 1963). According to Cochrane & Elliott (1998), since 1963 it used a square roundel made of the yellow Malaysian star on a light blue square with a dark blue border. The fin flash was a vertical light blue-dark blue-yellow stripes as shown above - see the photo at http://www.airliners.net/open.file/460850/L/. Now the problems start - Cochrane & Elliott (1998) reported that since 1983 the roundel is round as in http://homepage.eircom.net/~steven/images/malayroundel.jpg. However - I can't find a photo with this roundel. Not that there are no photos of Malaysian aircrafts....got plenty, but those show either a "classic" yellow-dark blue-light blue roundel ( http://www.scramble.nl/my.htm, http://homepage.eircom.net/~steven/images/malaymacchi.jpg, http://www.airliners.net/open.file/461024/L/ ), or the square markings http://www.airliners.net/open.file/201365/L/, http://www.airliners.net/open.file/579796/L/. Even the most modern plane (the Hornet) has small square markings on its fuselage (http://www.airliners.net/open.file/576602/L/). Government planes use rudder stripes in AF colors and the national flag as in http://www.airliners.net/open.file/581898/L/.